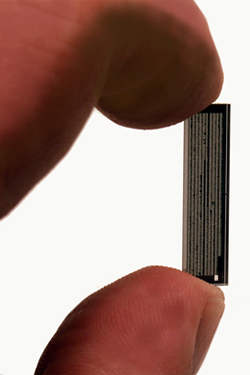 The first world's smallest "nano bible®"
Blessed in the company of the Creator of the universe. A timeless precious stone ! 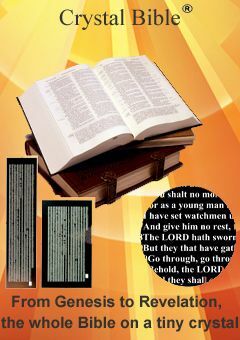 The Bible you can wear "Nano Bible®"
The first original world's smallest edition of the Holy Bible using Nanotechnogies. 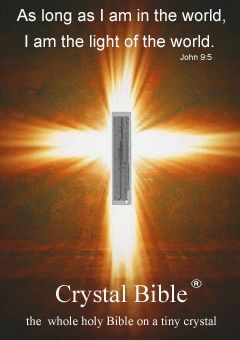 The Crystal Bible® (Nano Bible®) is the entire Bible, every page, every passage from "Genesis" to "Revelation", and is reproduced on a tiny glass crystal. 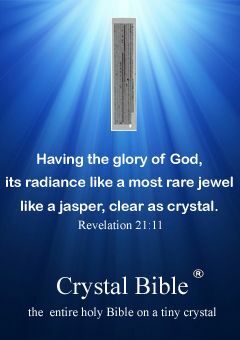 This small crystal is then embedded into some beautifully Christian Jewelry. 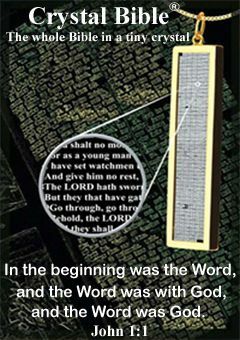 By using highly advanced Nano-Technology we are able to reduce the original book printed text of the Holy Bible over 1000 times into several versions including the King James Version, Latina Vulgate version, etc. 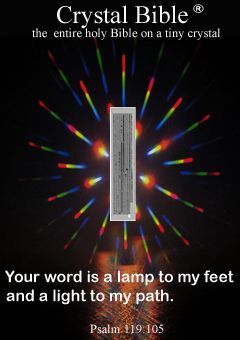 and then engrave the text on to the surface of a crystal making the world's smallest microscopic Bible! This is truly one of the most unique and timeless Micro Bible's in the world and perfect gift for all ages. The Word of God promises health for your body, prosperity for your finances, absolute peace in your heart and mind, long life, and most importantly eternal life filled with no more tears, no more sorrow and absolute bliss in the company of the Creator of the universe! You and your loved ones can now wear the Holy Bible anytime! * In this website, we are pleased to bring you lots of information about the different versions of the Bible and their history. May we all be blessed with peace, health and harmony.